David Hewitt spent a year in Tanzania in 1977-78 and so was delighted when in 2001 he had the opportunity to travel with George McOmwanda to meet friends in Tanzania. They made connection with Agape Church, and through them have supported a small revolving fund for income generation. This is managed with the help of Wilfred Ngima who, though housebound after an accident, is a very able facilitator. We provided him with a new laptop and software in 2011 for this purpose. Linked with Agape Church, a Maasai village called Mkonoo (45kms south) has a new church led by a Pastor Isaiah. We visited them in 2004 and saw the drought conditions, so the fund organised some emergency relief. 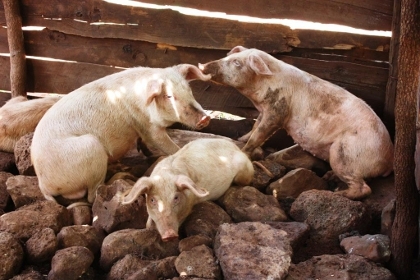 A portion of this money went towards setting up a micro-finance revolving fund, which has since been used to try to establish a pig-rearing project (unsuccessful) and more recently a sheep-rearing project. We have continued to support them in their endeavours to raise local productivity.